If I had to list things I’d like to receive in a parcel at work, then beef jerky would rank pretty damned highly…so imagine my excitement when the dream became a reality and the lovely blogger Willyums actually sent me a packet of chewy, meaty goodness to my desk last week. His lust for beef jerky is insatiable. A beef jerky preacher recruiting disciples through his super blog and twitter encouragement. We got chatting when he was trying to persuade me to invest in a food dehydrator. I asked what on earth I could make other than beef jerky. He replied turkey jerky. Not the biggest repertoire. 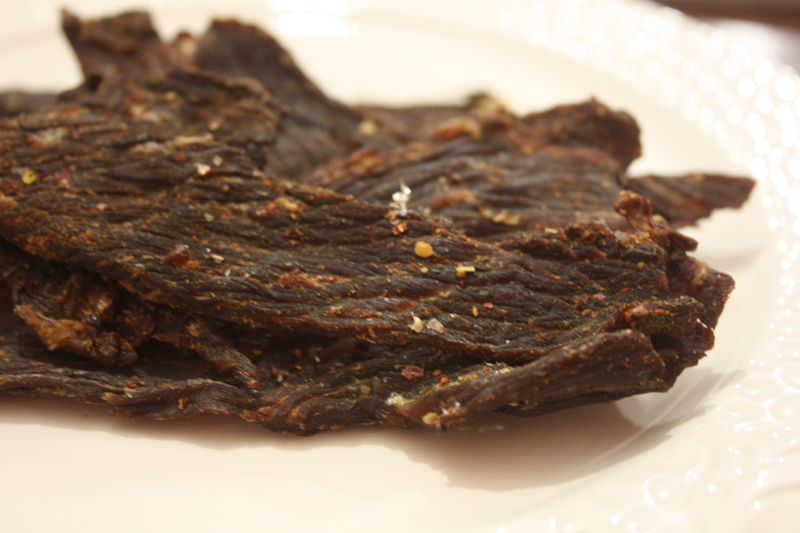 I thought about the size of a dehydrator, and decided that it would probably turn out to be more clutter in my kitchen—probably not worth it just for the sake of beef (and turkey) jerky…but having chomped my way through a bag of Willyum’s smoky, meaty delicious jerky I’m on the verge of changing my mind.